The next phase of Destiny 2 is the Season of the Forge - following Destiny 2: Forsaken's initial Season of the Outlaw - which is scheduled to kick off on Tuesday, November 27. Bungie says more details about the next season and Destiny 2's three-part annual pass are on the way - and in the meantime, the studio shared some nifty Gambit changes coming in the Season 5 update. 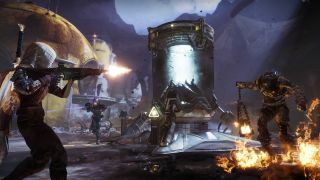 Gambit is an exciting mode and was well-received, but over time, a few minor issues have snowballed into bigger ones which are starting to put some players off. Changes coming in Season 5 are looking to address these concerns, starting with Gambit's piddling rewards. For starters: as of Season 5, all Gambit rank-ups will award Gambit-exclusive gear, meaning no more disappointing blue drops. The Infamy rank-up points awarded by Gambit bounties are also being doubled across the board, and many bounties are being retooled "to take less time and be easier to complete," designer Robbie Stevens said. Mercifully, Bungie's also adding a bounty for killing Primeval Envoys - presumably to help direct players who still haven't gotten the message that you really need to kill those. The Primeval Slayer buff, which increases the damage you deal to the Primeval boss, is getting some changes of its own. The catch-up mechanic that, until now, effectively punished players for summoning their Primeval first by handing hard-earned stacks of Primeval Slayer to the other team, is being toned back so that "teams that summon their Primeval second can only ever receive one 'catch-up' stack of Primeval Slayer." This should make the race to summon the Primeval more competitive, and will hopefully make the boss-killing phase of Gambit longer and more exciting overall. Finally, the heartbreaking Primeval Meatball bug which can cause players to lose their Malfeasance Exotic quest award to the enemy team will be fixed on September 27. Grinding Gambit and getting the meatball boss to spawn is soul-crushing enough, so I can't imagine what it's like to arbitrarily lose the reward for it, let alone unwillingly hand it over to a team of enemies who've no-doubt pissed you off at some point. Thank goodness that's being fixed. More sandbox changes are also coming to Destiny 2, including improved console performance and buffs to two supers.